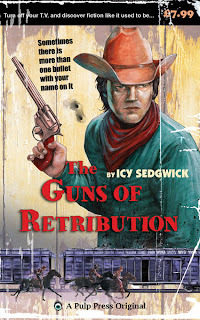 Tweet As I said in my post about writing historical fiction, a few people asked me questions on Twitter about The Guns of Retribution. As it comes out in paperback on Saturday, I thought I'd answer a few more. Writer Emma Kerry asked me about my writing process, and how the story grew, so I thought I'd tackle that today. I started off with my protagonist, Grey O'Donnell, and my villain, Jasper Roberts, at the same time. I think you can't really know your protagonist until you know the antagonist so it made it easier to develop them simultaneously. They share a dark past and the hatred between the pair of them fuels the events of the book so I'm not sure I could have written one first, and then the other. In the first draft, Grey was actually an outlaw, and his companions Billy Cole and Mahko comprised his gang. I let Grey tell his story, but he kept doing nice things for people. I wasn't completely sure that people would "buy" the idea of a well-mannered and thoughtful outlaw. It's not entirely far-fetched (Robin Hood, anyone?) but it just didn't sit right with me. I did what any self-respecting writer does when their characters won't do what they're supposed to and I switched from first person point of view to third. It didn't work. Apparently the idea of a nice outlaw didn't sit right with Grey either. Partway through writing, he asked me, ever so nicely of course, if I could change his profession. According to him, he was actually a bounty hunter, and Mahko and Billy were not gang members, but rather his friends. As it happened, I'd already written a murder in the Old West in my Dead Man's Hand trilogy, and so it came to pass that Grey ended up as the bounty hunter pursuing this particular murderer. As Grey was so involved with the decision, I switched it back to first person to let him tell the story his way. It always pays to keep your protagonist happy. As for my writing process, it was a little haphazard, if I'm honest. I'd never really used outlines or writing plans at all before - I was always very much a pantser. 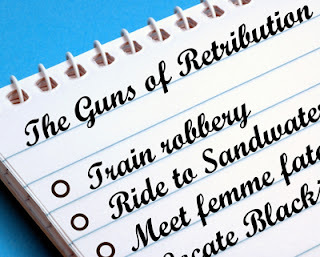 However, I didn't want to write myself into any dead ends and as I had an idea of the ending before I began, I wrote a rough list of bullet points for the major scenes. I simply made up the bits in between as I went along. It's quite a flexible method - you have the security of knowing what's going to happen and when, but you still get to explore various possibilities along the way. I'd already immersed myself in Western novels and films, but to add to the experience, I listened to the 3:10 to Yuma soundtrack while writing, which gave me a wonderful backdrop to the story. One other thing that helped immensely was the 750words.com site. I made sure I wrote a portion of the story every day, so even if I only wrote 750 words, I'd be 750 words further into the story than I would have been otherwise. I'm quite competitive so I used that to my advantage, and seeing that row of ticked boxes every day spurred me on to keep writing. I did have the problem that I didn't actually want to finish it, a problem I wrote about in April, but I put my fears aside and wrote the ending. I edited the first draft quite extensively, and I also used beta readers once I had a draft I was happy with. I can't thank Rob Diaz, Jen Brubacher, Sam Adamson and Adam Byatt enough for their input - thankfully, no one had an issue with any of the sections I didn't want to part with, and I agreed with everyone's comments! Extra thanks go to Carrie Clevenger for talking over plot points with me when I got stuck. Tomorrow, I'll be discussing character creation! If any of these has whetted your appetite, The Guns of Retribution is available for Kindle (here for US and here for UK) for either $1.85 or £1.14, although the price will be going up soon! You can also preorder the paperback ahead of its release on Saturday. Also, feel free to sign up for my newsletter if you'd like to be kept up to date with blog posts and releases! Wow, I'm familiar with that one! I think sometimes I'm afraid to succeed.